AXIS AddPrinter offers an easy network printer installation process. The intuitive installation saves time and effort and provides printer discovery, installation guidance and simple troubleshooting. AXIS AddPrinter also provides easy access to the print server’s web interface for management purposes. 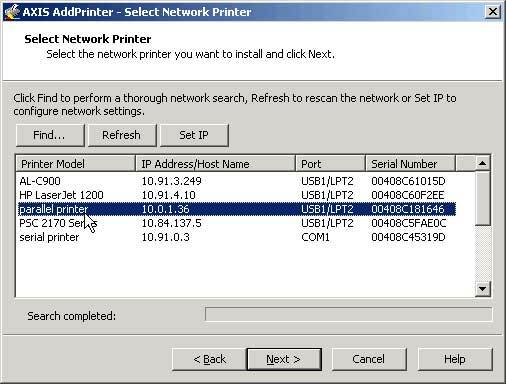 AXIS AddPrinter simply adds a standard Windows printer object, no additional software is installed. Note: AXIS 1650 is not supported by AXIS AddPrinter, please refer to the user documentation for information on how to install this product.